What sets Aloeride aloe vera apart from the competition is that Aloeride is a specialist whole leaf aloe vera feed supplement that 100% conforms to Consultant Gastroenterologist and internationally renowned aloe vera expert Dr. Ivan Danhof MD PhD definition of ‘best aloe’ (see below). Yet Aloeride is very much more affordable than lesser quality aloe vera products. If you cannot find your question fully answered within this website, then please get in touch with us because we would love to help you. More aloe vera molecules: Aloeride gives you a great deal more of the nutrient molecules that gave aloe vera its many accolades throughout the Ages. We grow the most nutrient-dense aloe vera species (Barbadensis Miller) under optimal, certified organic conditions and freeze-dry process the wholeleaf in a unique way to an unrivaled quality control. Multiple, independent laboratories confirm this and you too may find these test results an eye opener. A job worth doing is worth doing very well, it’s as simple as that. What sets Aloeride aloe vera apart from the competition? 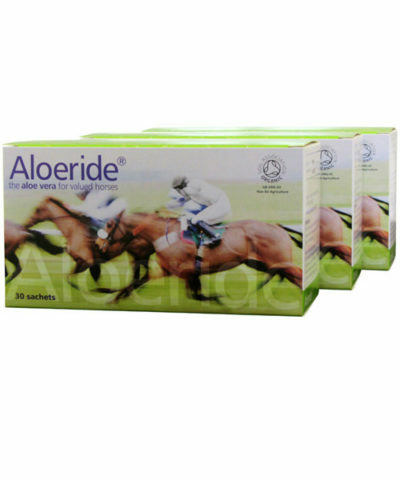 The Aloeride aloe vera that your horse gets is exactly the same exemplary quality as the Aloeride Extra Strong we make for people. We’re only interested in the best which is probably what you want for your horse also. Quite right too! With Aloeride you give your horse properly meaningful servings: Aloeride starts with 12 litres of certified organic aloe vera juice and we carefully optimise this into 30 powder sachets per carton (one month worth). Per serving this is the equivalent of 440mL which is a properly meaningful amount for an adult horse; of course smaller horses (e.g. a 12hh pony) would be fine with ½ sachet a day (make sure you close/seal sachet quickly after opening). Another thing that sets Aloeride aloe vera apart from the competition is MUCH better value for money. We sell proven better quality at a much more affordable price because it helps you look after your horse(s) with the best aloe vera. Aloeride helps you to multi-carton loyalty discounts. We even have an equine subscription offer to spread out payments and our six-carton offer comes with Worldwide Free Shipping. Aloeride aloe vera is NOPS negative: every Aloeride batch is tested by the accredited Newmarket laboratory LGC for all current Naturally Occurring Prohibited Substances and there are no adverse analytical findings for Aloeride. Aloeride does not contain any synthetic molecules. Aloeride aloe vera is great news for fussy eaters: aloe vera gel/aloe vera juice is not very palatable (neither for horses nor for people, one of the reasons why Aloeride came to be! 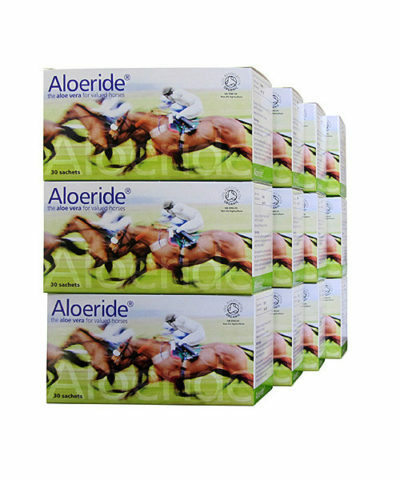 ), so many horse owners delight in Aloeride being the palatable powder that even fussy horses eat. Aloeride aloe vera for horses is the only Soil Association certified organic aloe vera for horses in the world. Their meticulous standards are part of our quality control and you can feel assured that an independent, international official body approves of Aloeride. What sets Aloeride aloe vera apart from the competition? We help you a lot. We are a very personable company, friendly and knowledgeable too. You can come to us with questions any time and we will always do our utmost to help and to make you happy. Just drop us an email or give us a call on 01858 464550 (Intl. 0044 1858 464550).